As most of you are aware, Dr Denise is expecting her first baby in mid-May this year. Dr Denise is expecting to resume her clinical work at the end of the year. She understands that her absence may bring some inconvenience to some of her long-term patients, especially those she has been looking after for the last 10 years. Hence, she has carefully selected Dr Cynthia Tuazon to look after her patients during this period. Dr Denise would like to thank all her patients in advance for their understanding. Denise is native of Kuala Lumpur, Malaysia, and moved to Brisbane following high school, to further her studies abroad. She received her Bachelor of Dental Science Degree with First Class Honours from the University of Queensland. Upon graduation, Denise was offered a position in Brisbane Dental Hospital where she gained enormous amount of experience in the public sector especially with the opportunity to work with specialists in various sectors of dentistry. 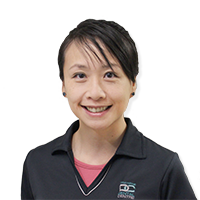 Following further experience in the private sector, Denise joined the team in Strathpine Dental Centre and played an important role in the practice’s development. She now holds the responsibility as the Principal Dentist offering high standards of dental services in a conservative and ethical manner giving strong emphasis on preventative dental care. But most of all, Denise is an active listener with a great touch especially with dental phobic patients and also enjoys treating kids. Denise is experienced in managing patient with dental anxiety and phobics as well as offering the option of dental treatment with nitrous oxide sedation. As Denise strongly believes in continuing education, personal and professional development, Denise spends time furthering her knowledge and has a special interest in the field of orthodontics. Having completed a two year intensive orthodontic training program and being an Invisalign Accredited dentist, Denise is able to offer more treatment options to help assist her patients achieve a beautiful healthy smile. Denise also routinely attends other trainings including Cosmetic Dentistry, Crown & Bridge work, Endodontics and Paediatric Dentistry. When Denise is not caring for her patients, she enjoys badminton and cycling on her road bike, art and craft, going to the movies, travelling and dining. Denise also speaks Cantonese, Malay and basic Mandarin.